Brampton won’t be getting a full-fledged Ryerson University campus after all. The much anticipated satellite campus, which was slated to be built near the Brampton GO station, is off, unless the city can find a new university partner, The Pointer has learned. 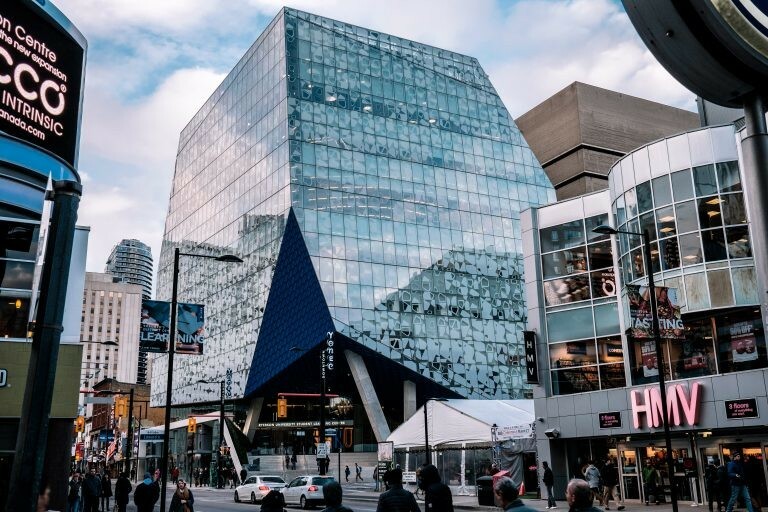 Johanna VanderMaas, Ryerson’s manager of public affairs, said in an email that the cancellation followed last October’s decision by the PC government to pull the $90 million committed by the previous Liberal government for the downtown project. This means Brampton, Canada’s largest city without a stand-alone university campus, might keep that designation for the foreseeable future. “As you know, the provincial government decided to not proceed with the planned expansion in Brampton — there will not be a branch of Ryerson opening in Brampton,” VanderMaas wrote. However, the accompanying Cybersecurity Catalyst and Centre for Innovation projects are still moving along, she said. Ryerson’s Chang School of Continuing Education, part of the cybersecurity offering, also began a few other courses in the West Tower of Brampton City Hall as of this week, launching the small continuing education program on Monday, Jan. 21. 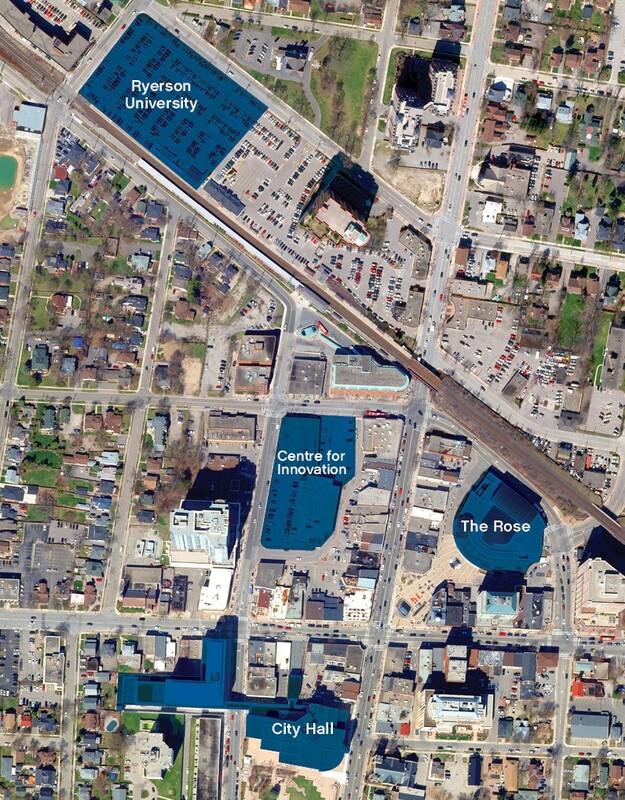 Location where the Ryerson University campus was to be built. Mayor Patrick Brown was perplexed when told about the revelation that Ryerson will not be partnering in the downtown campus that was to be built next to the GO train station. “That may be a typo or a miscommunication. Our indication from Ryerson is that they have full intentions to be part of our efforts to be in Brampton to have post-secondary education,” he told The Pointer. His confusion was shared by some members of city staff during informal conversation, with one city worker calling the news worrisome. And it indeed flies in the face of what both Ryerson and the city have been telling the public. During a Nov. 2, 2018, special city council meeting, Glenn Craney appeared before the executive in his capacity as Ryerson’s vice provost to reassure councillors and the public that the university was looking into continuing to pursue its portion of the project, despite the loss of $90 million pulled by the province. 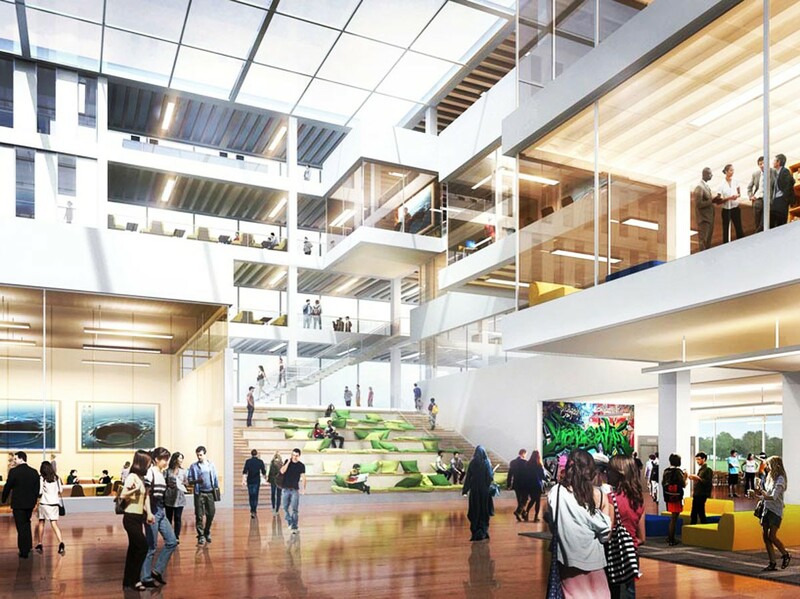 Rendering of the now scrapped downtown Ryerson University campus. The previous city council committed to providing $150 million to the combined project, $100 million for a centre for innovation and $50 million for the Ryerson campus. “So of course the Ryerson campus component has to be reviewed with Ryerson as next steps with the province,” former CAO Harry Schlange said at the November meeting. The remarks made by Schlange and Craney suggested that neither side was giving up on the idea of a downtown campus. Work does continue for the launch of the CyberSecure Catalyst, according to VanderMaas. “The Catalyst will be a hub for collaboration and excellence in cybersecurity teaching and certification; incubation and acceleration; applied research and development; and public education and policy development,” she wrote. That’s all a far cry from the original promise of a full-fledged, bricks-and-mortar campus in the heart of downtown. The revelation is the latest indignity Brampton has suffered over the question of Ryerson’s expansion into the city. Last October, the day after the municipal election, the Doug Ford government announced it would withdraw the $90 million the previous government, under Kathleen Wynne, had pledged toward building the campus. The Ford government blamed what it deemed to be a $15 billion deficit for the decision to renege on funding for the Brampton campus project and two others in the GTA. The official Opposition at Queen’s Park put forth a motion to restore the funding within weeks of the cancellation, but the majority PCs voted down the NDP bill, leaving the future of the campus uncertain. Planning for the university satellite in Brampton fell into disarray, and the November special council meeting was called to find some clarity on what was happening with the project. One big question hangs in the air. What will happen to the $50 million the city committed if the campus really won’t be happening?